Several organizations are hosting an informational forum on Monday to address the growing problem of fracking in Michigan. 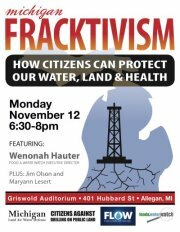 Michigan Land, Air, Water Defense & Citizens Against Drilling on Public Lands with support from FLOW and Food & Water Watch are hosting the forum with speakers who will address a variety of tactics people can use to stop and possibly ban the practice of hydraulic fracturing in Michigan. Calling the event “Michigan Fracktivism,” the organizations want people to not only know what the consequences of fracking will be for Michigan, but how they can be part of an effort to stop it. Please join us for an evening focused on the topic of fracking and how we can stop it here in Michigan. Hear from experts in law, media and organizing for a workshop-meets-forum-meets-presentation event! Attendees will have the opportunities to hear about legal strategies, media & organizing your community from renowned speakers! This event is free, light refreshments will be served. ← Where did the GR elite spend their money in the 2012 elections?